Mini hot hatches are engineering wonders. Their diminutive sizes aren’t something to be looked down upon, as these cars pack a punch and can easily smoke out bigger counterparts. Well, not so big, but you get the gist. Anyway, if these adorably small hot hatches face each other on the drag strip, which do you think is the fastest? 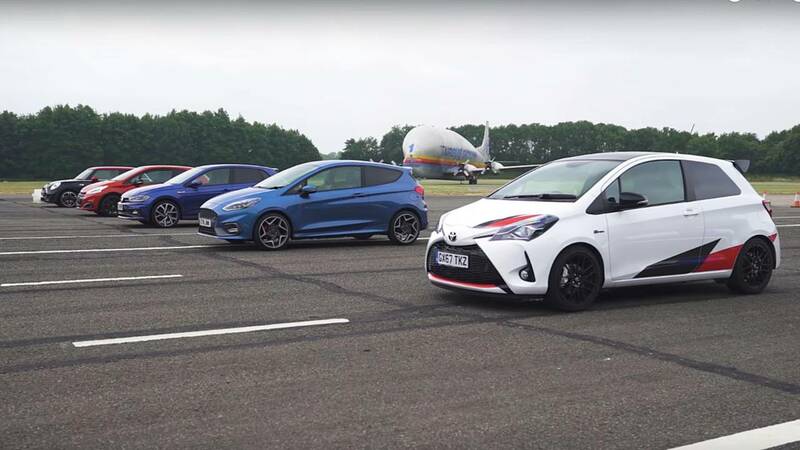 Luckily, five of the hottest small cars meet in an empty tarmac for a mega drag race. Three European cars are in the lineup, which are Volkswagen Polo GTI, Peugeot 208 GTi, and Mini John Cooper Works. There’s also one (kind of) American in the list, which is the Ford Fiesta ST, while the Toyota Yaris GRMN is also present to represent JDM. Right on the whim, before watching the drag race, it looked like a runaway victory for the Mini JCW because of its 2.0-litre turbocharged engine that spits out 231bhp and 236lb-ft of torque. It’s the most powerful among the bunch, although it’s also heavy. After watching the video, though, the Yaris GRMN came out on top with 14.5 seconds in a standing quarter mile. It was uncanny, and proved that its 212bhp 1.8-litre supercharged engine is more than enough to pull its lightweight body, even with its measly 184lb-ft of torque. Trailing it is the Mini JCW at 14.8 seconds. Not bad, really, considering how it almost caught up with the Yaris towards the end of the strip. After the Mini, the Fiesta ST finished third at 15.1 seconds. The 200bhp 1.8-litre turbo by Ford Performance is a serious contender, but it didn't have a great launch. Next to the Fiesta ST is the VW Polo GTI, which took 15.5 seconds to finish the quarter mile. The Peugeot 208 GTi finished closely behind at 15.6 seconds. Both cars had a rough launch from standstill. The second part of the video shows a rolling start race at around 30 mph. The Mini JCW was the better performer on this end, proving that the Yaris’ perfect launch was its main advantage on the standing drag race.